An artist's concept of Scholz's star with its brown-dwarf companion in the foreground during their flyby of the solar system 70,000 years ago. The sun would appear as a bright star from the pair (left background). A dim red dwarf and its brown-dwarf companion likely grazed the outer edges of the solar system 70,000 years ago in what scientists say was the closest encounter ever between our sun and another star. At its closest approach, the binary pair — known together as "Scholz's star" — passed by the sun at a distance of less than 1 light-year, according to a study of the binary's velocity, researchers said. One light-year is the distance light travels in a year — about 6 trillion miles (10 trillion kilometers). The nearest star to the sun, Proxima Centauri, is 4 light-years from Earth. "The small tangential motion and proximity initially indicated that the star was most likely either moving towards a future close encounter with the solar system, or it had recently come close to the solar system and was moving away," Eric Mamajek, of the University of Rochester in New York, said in a statement. Mamajek was the lead author of an international team of astronomers who calculated the path of the star. "Sure enough, the radial-velocity measurements were consistent with it running away from the sun's vicinity — and we realized it must have had a close flyby in the past," Mamajek said. In 2013, astronomers first spotted the small red dwarf star, now about 20 light-years from the sun, in the constellation Monoceros. The binary is named Scholz's star after its discoverer: astronomer Ralf-Dieter Scholz, of the Leibniz-Institut für Astrophysik Potsdam in Germany. The tiny star has less than 10 percent the mass of the sun, and its companion brown dwarf is a failed star that lacked the necessary mass to begin fusion in its core. 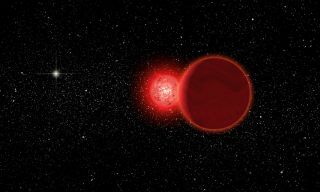 The red dwarf first caught the attention of the astronomers when they realized that it had an unusually slow motion across the sky for such a nearby star. The science team used the South African Large Telescope (SALT) and the Magellan telescope at Las Campanas Observatory in Chile to study the motion of the star. They then traced its path backward to its position 70,000 years ago, when it had its closest brush with the solar system. Out of 10,000 simulated orbits, the star passed through the outer edges of the Oort cloud, the cloud of comets and icy rocks that circle the solar system, 98 percent of the time, passing within 0.8 light years (5 trillion miles, or 8 trillion kilometers) of the sun. Only one of the simulations brought it inside the Oort cloud, where it could have sent showers of comets raining down on the solar system. Could humans see Scholz's star? At its closest point, Scholz's star would have been a 10th-magnitude star — 50 times too faint to be seen with the naked eye. However, brief flares on the star could have lit it up thousands of times brighter, making it potentially visible to early mankind for a few minutes or hours at a time, the researchers explained. The previous top contender for the closest flyby of the solar system was the star HIP 85605, predicted to graze the solar system in 240,000 to 470,000 years. However, Mamajek and his team demonstrated that the original distance to the star was underestimated by a factor of 10. At its more likely distance of about 200 light-years, the newly calculated path would not bring it within the Oort cloud, they said. With its goal of charting a three-dimensional map of the galaxy, the recently launched European Space Agency's Gaia satellite will go a long way toward helping astronomers identify which other clouds might have had a close encounter with the solar system, or will be dropping by in the near future. "Other dynamically important Oort-cloud perturbers may be lurking among the stars," Mamajek said. The research was published in Feb. 12 edition of The Astrophysical Journal Letters.